This popular monthly discussion project for the community, funded and organized by OCRJC, has been running successfully for more than two years. We are active in the county-wide drug take-back program with local law enforcement and pharmacies. There is often new and innovative work being accomplished through these projects, and also through our primary partner, the Vermont Department of Corrections. 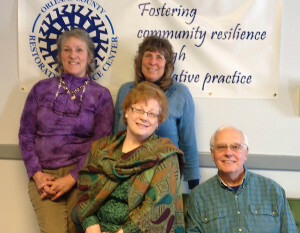 OCRJC partners with a number of regional organizations, including Newport Community Garden, Northeast Kingdom Learning Services, Umbrella, Northeast Kingdom Human Services, Northeast Kingdom Community Action, the Department for Children and Families, Newport Probation and Parole, the NEK Department of Health, and a host of others. We offer ongoing volunteer training. We host occasional community forums on matters of local interest or contention. We plan to launch a low-cost or pro bono legal clinic.